The Crustacean C.A.R.E. mission is to make accurate and easily accessible care information widespread by forming a network of websites that follow the C.A.R.E. principles. LHCOS will join chelipeds with other quality hermit crab care sites and form an internet island paradise for hermit crabs and their owners. This will make available an unlimited resource of knowledge for those dedicated to keeping healthy, happy hermit crabs. We want to strengthen our voice with respect to the products developed for hermit crab care and ensure pet stores and owners understand the proper care methods. We promote humane treatment of these animals to the world so there is less abuse and mistreatment due to the lack of proper care information. Our goal is to build a community of quality hermit crab care sites that can be relied upon for accurate and current care practices. The Crustacean C.A.R.E. 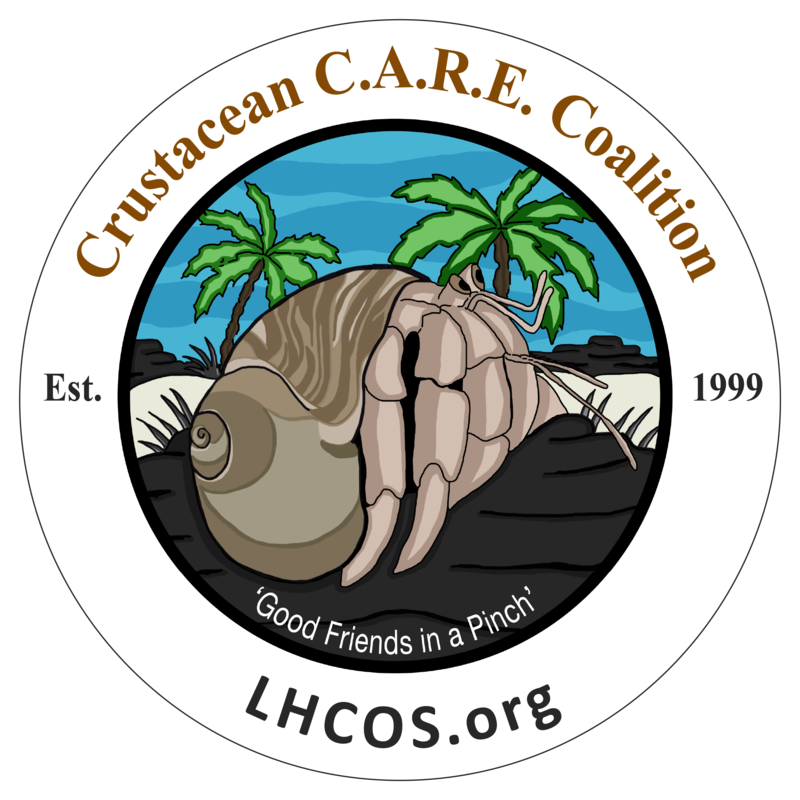 Coalition program brings hermit crab care websites under the umbrella of LHCOS. The Local Representatives and Junior Local Representatives programs add a local focus to our program. The Crab Street Journal is the flagship site for the Land Hermit Crab Owners Society C.A.R.E. program. It encompasses all of the principles of the program. Our goal is to raise awareness about safe practices. The Say No to Painted Shells campaign is one example. In 2016, LHCOS/CSJ became the first hermit crab care exhibitor at a national pet expo. With a crowd of 25,000 people we brought our message to the public in a big way. We returned to the expo in 2018 and in 2019 we added a local reptile show to our schedule. Our goal is to continue to use existing research on the Coenobita species to further our knowledge and improve our care practices. We reach out to researchers, biologists and students to gain access to valuable data and seek input. We advocate rescue and re-homing over purchasing. Our program was the very first hermit crab adoption program. It is growing at a rapid pace. Our goal is to provide accurate and current information to the public free of charge so they have the information they need to properly care for their pet land hermit crabs. We accomplish this through online articles, caresheets, informative videos, pet expos, social media, sharing information on our forums as well as working with pet stores to improve their conditions. In 2018 the Claws in the Classroom program was launched to provide assistance to classrooms keeping pet hermit crabs. Current classroom grants provide the wrong information and the wrong list of supplies. We contacted the grant program but did not receive a reply. We decided to create our own program. The Crab Street Journal is the flagship site for the Land Hermit Crab Owners Society C.A.R.E. program. It encompasses all of the principles of the program.